Let’s not kid ourselves: ticking off the best superhero movie villains is, at this point, a somewhat pointless endeavor. We all know who’s snatching up the top slot (“Why so serious? !”), and more often than not the ensuing list – of which there are no shortage on the oh-so wondrous interwebs – tend to fall predictably in line with the Greatest Superhero Movies consensus. Boooring! So, instead, let’s take a moment and highlight those less fortunate scenery-chewing thespians; the tremendous talents that really went for it, delivering sensational bad guy performances in pictures that didn’t deserve their energy and were generally dismissed as mediocre or downright wretched. After all, there are some fantastic spot-on characterizations and moments of madcap malevolence that deserve their devilish due here! So join me in quaking in their magnificently fiendish presence! Pyew! Hands down the worst film included on this list, Hugh Jackman’s first solo X-flick is a truly embarrassing, hacky assemblage of hoary clichés, appalling effects and hyper-dopey creative decisions. However, Schreiber’s teeth-gnashing turn as the animalistic hero’s adamantium-laced half-brother is this disaster’s lone saving grace. While lacking his X-Men predecessor Tyler Mane’s more comic book-appropriate blonde locks and hulking physique, the actor sinisterly taps into the role’s darkly funny, blood-curdling charisma, playfully rebounding between soft-spoken statuesque menace and full-blown psychopathic savagery. Had Origins understood how to effectively weave him into the narrative, and given him something interesting to do, he’d likely be remembered for a lot more than his goofy (and never-ending) CG-aided pouncing and clawing sequences. These two both showed up ready to play and were instead sidelined by an overly-complicated and bloated (albeit still modestly engaging) story that ignored them for vast chunks of time. Rourke – whose numbed Russian Peter-Stormare-in-Fargo-like heavy is a fun amalgamation of Iron Man foes Whiplash and Crimson Dynamo – gamely disappears Method-style into the greasy, hulking hide of his mumbling vengeance-minded genius. Alas, despite his very cool dreadlocked visage, ugly menace and tech gimmickry, the movie fails to establish him as a fearsome threat. Following a spectacular attack on the Monaco Grand Prix, he mostly just sits around waiting to do something, and when he finally goes back into action it’s underwhelming to the max. Rockwell’s hilarious anti-Stark arms dealer buffoon – a de-aged, doofed-up version of his comic book counterpart – gets the juicier scenes and funny lines, yet ranks even lower on the danger-scale. Thus, we find ourselves watching Downey’s tin-plated titan facing off against two genuinely memorable, eccentric opponents who are, unfortunately, obviously inferior to him in every conceivable way. Not exactly a stellar way to set the stakes particularly high. There’s no good reason Haden Church couldn’t have joined the lofty ranks occupied by all-timer Spidey nemeses Willem Dafoe and Alfred Molina. 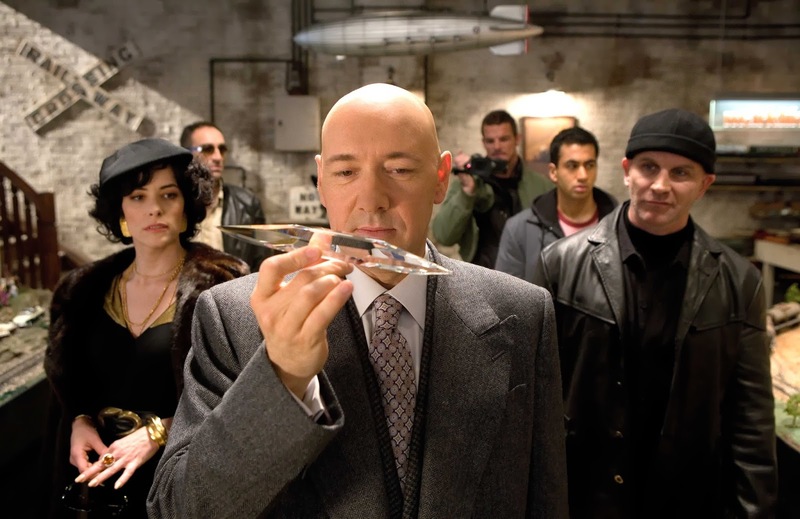 Perfectly cast, and aided by state of the art effects (Sandman’s beautiful and haunting Universal Monsters-inspired origin scene remains a genre stand-out), he and director Sam Raimi display a flawless understanding of the perpetually-unsuccessful working class spirit of Stan Lee’s immoral granular creation. Alas, too many studio intervention-induced subplots and villains (New Goblin! Symbiote!! Venom!!!) result in an uphill battle for the ingenious actor, who nonetheless valiantly tries his damnedest to convey the wounded humanity and redemptive journey of his antagonist in scant screentime. Worse, when the storytelling really jumps the track in the second hour, the concrete-fisted criminal’s motivation and relatable mortal form go entirely out the window, leaving us with a giant groaning monster that lacks an iota of soulfulness or pathos. Perhaps it’s fitting that it was Sandman, of all of Spider-Man’s rogues, who wound up having the worst luck storming the big screen. It sure doesn’t make the end result sting any less though. 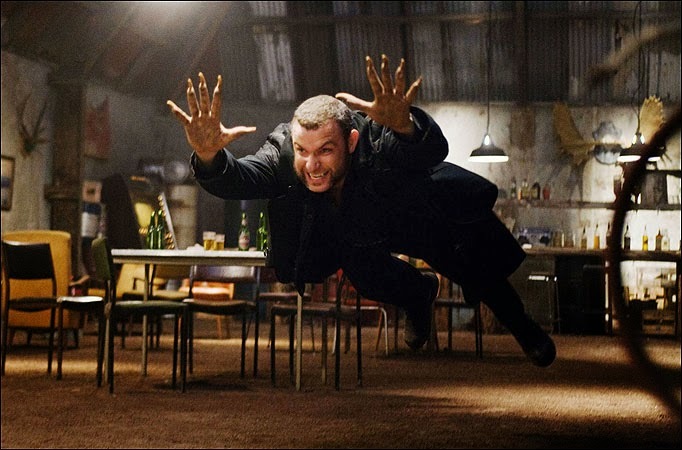 Rarely has any actor in a superhero movie gone as gleefully over the top silly as Farrell does in Mark Steven Johnson’s so-so comic book adaptation without crashing and burning (take notes Tommy Lee Jones, Uma Thurman, John Leguizamo and Dominic West). 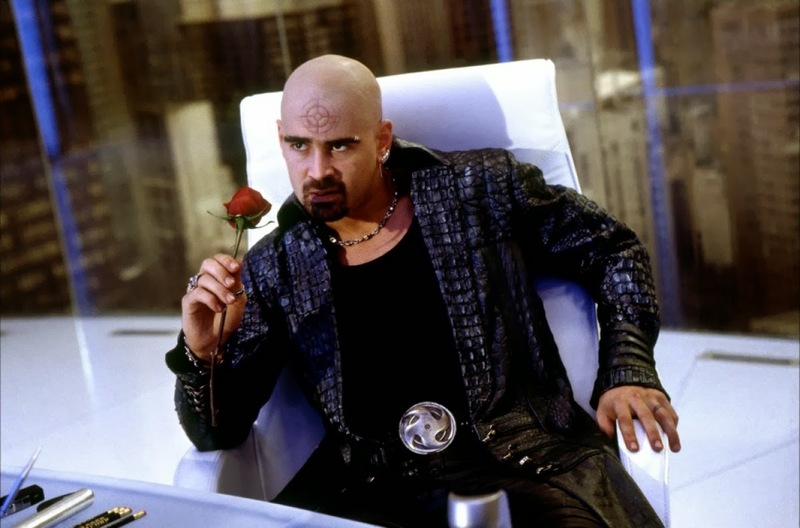 Introduced to the brash party time rhymes of House of Pain, the actor flamboyantly steals every single one of his scenes, pushing his thick Irish accent, hyperactive eyebrows and bizarre mannerisms masterfully right to the edge of Cartoonsville. And yet it all works so wonderfully! Whether hissing crazily at a rat or slyly murdering an old woman with airline peanuts, Bullseye is a hysterical figure of giddy lunatic mischief, scoring huge laughs by playing up both his cocky deadliness and cape-swishing campiness simultaneously. It’s weird, in retrospect, that 20th Century Fox viewed Jennifer Garner’s vanilla Elektra as the breakout character, given Farrell’s broad crowd-pleasing antics and spotlight appearance in the movie’s sequel-teasing credits stinger. Borrowing a line from Frank Miller’s classic “Man Without Fear” Daredevil story arc, Farrell declares mid-film: “You’re good, baby. I’ll give you that. But me? I’m magic!” Pretty hard to disagree with him there.